My name is Richard and I work in the fire service. I want to thank my mum Sharon for her unwavering support after I was diagnosed with depression. Three years ago my then partner and I lost a baby – we had a miscarriage. I told myself these things happen, get on with it. Then last summer I attended a road traffic accident. The casualty trapped in the car was pregnant. As soon as I heard, something just turned. I had to take time off; I wasn’t safe because of my huge mood fluctuations. There were days I didn’t know what I was doing, or who I was. I was in a bubble. When I got to my lowest, I planned to take my own life, but my partner called the GP who immediately referred me to the psychiatric team. It was tough. I’ve got two small kids and I pushed my family away, resulting in my relationship ending. My mum Sharon was there for me at the hardest point in my life. She started to drop by when I wasn’t expecting her, making sure I was coping. 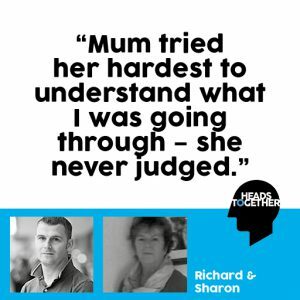 Mum tried her hardest to understand what I was going through – she never judged and I could open up to her. I can’t thank my mum enough for everything she did – and continues to do. I am back at work now. I still have bad days, but they are manageable. My job is massive to me. Now being a Blue Light Champion means I can help someone else – just like my mum did for me.